Julia awoke with a jolt when she struggled unsuccessfully against Cleveland Cliffs Iron Company, the Upper Michigan Power Company, the Michigan Department of Natural Resources, and her hometown and some of its citizens in an effort to save Presque Isle Park and Presque Isle Peninsula from environmental damage. The small Upper Michigan Power Company provided electrical power for Cleveland Cliffs Iron Company, a corporate landlord in Michigan’s Upper Peninsula and a major employer in Marquette. The power company looms at the mouth of the Dead River, less than one quarter of a mile from the entrance to Marquette’s historic Presque Isle Park. The Ojibwe Indians named the river the Dead River because they considered it a scared stream which the spirits of their chiefs and sachems navigated on their final journey to Lake Superior, the ‘great water.” The “great water”, Dead River, and iron ore were naturally occurring assets that combined to create a corporation and a symbolic final journey for Julia K. Tibbitts. Iron ore pellets from the mines west of Marquette were loaded onto ore carries from the ore dock, visible just behind the power plant. A huge coal pile built up from coal delivered by ships to the harbor and carried in on the coal unloader directly in front of the ore dock dominated the landscape and leaked pollutants into the atmosphere and Lake Superior. Julia believed that the negative effects of the expansion far outweighed any positive effects for the community and environment. She helped found Superior Public Rights to rally Marquette citizens to legally stop power company expansion. She no longer sleepwalked and she grew in directions she had never imagined during her battle years of 1973-1977. Growing up in Marquette Michigan, Julia loved the natural beauty of the area and the vistas of Lake Superior and Presque Island, a 323 acre forested, oval headland jutting into Lake Superior from the northern tip of Marquette. A small park that generations of people enjoyed was an integral part of Presque Isle. “The history of “The Island,” as Marquette citizens called Presque Isle, stretches back to at least 3,000 years from prehistoric inhabitants to 19th century businessman and acting director of Cleveland Iron Company Peter White. He successfully petitioned Congress to pass a bill deeding Presque Isle to the City of Marquette which it did on July 12, 1886. One of his first projects was building a road from Marquette to Presque Isle Park and planting tall Lombardy poplar trees along Lakeshore Boulevard. In her book, Let’s Go Around the Island, Julia K. Tibbitts reminisced about the central part that Presque Isle played in her life and in the lives of other Marquette citizens. She remembered walking the beaches for hours exploring and collecting colorful Lake Superior washed rocks. She and her future husband Munro Tibbitts belonged to a club on the western shore of the Island that met every week. She recalled the one way drive all around Presque Isle, and walking, biking,, skiing or snowshoeing around it. She loved the breakwater and reminisced about how she and her friends walked its full length.. Some people called the breakwater the break wall, but no long time Marquette natives did. Long time native Julia Koch called it the break water. Born on October 1, 1917 to Otto and Nota Schaffer Koch, Julia Koch was raised in Marquette. She graduated from Principia Upper School in St. Louis, Missouri in 1936 and from Ogontz School for Young Ladies in Philadelphia, Pennsylvania in 1938. In 1965, she earned a degree from Northern Michigan University. Although she and her husband had a second home in Arizona, she lived in Marquette in body and spirit until her death in 2008 at age 90. Julia’s early life and education helped develop the necessary stiffness of spine enough to fight her future legal battles. Principia Upper School, a Christian Science School, then as now was dedicated to teaching students to consider events and their lives from the basis of principle, as Mrs. Mary Kimball Morgan intended when she founded it in 1897. At the Ogontz School for Young Ladies in Philadelphia, Julia learned the importance of physical activity, especially military drills and ramrod straight posture. Principal Miss Abby Sutherland believed that as well as pouring tea and walking gracefully, marching as an all absorbing and democratic form of exercise would teach her students self-discipline, self-direction, and self-reliance. Her students learned to march, to think, to be ladies, and to continue marching far into their futures. Marching into her own future, Julia Koch married Munro Longyear Tibbitts, and during their 33 years of marriage they raised two sons, Richard and Frederick. Munro served as president of the Longyear Realty Company of Marquette, a corporation created to carry out the legal provisions of the will of his uncle John Munro Longyear who owned timberlands and iron mines throughout Michigan’s Upper Peninsula. Munro Tibbitts also was the president of several smaller corporations, served as executor of lands and mines that others had owned jointly with John Munro Longyear, and managed millions of dollars worth of holdings through his office. One of the business deals that Munro Tibbitts brokered turned out to be hauntingly ironic for him and his wife Julia. Representatives of Cleveland Cliffs Corporation convinced Munro to sell them several acres of land on Big Bay Road, claiming that Longyear Realty and Cleveland Cliffs had negotiated to the benefit of Longyear in the past. After much agonizing, Munro sold them the land for an ash dumping site for their power plant, Upper Peninsula Generating Company. Julia described the dump as “an environmental disaster” and she wrote that Munro never stopped feeling responsible for selling Cleveland Cliffs the land for their dump. In 1973, two important events in Julia’s life converged. In 1973, Cleveland Cliffs decided to expand the generating power of its small utility, Upper Peninsula Generating Company. The power company which provided electric power for Cleveland Cliffs Iron Company eventually expanded to four times its original size. All of the units were eventually built between 1973-1978, during its battle with Superior Public Rights. On April 17, 1973, Munro Longyear Tibbitts died. Returning to Marquette after his funeral services, Julia took a welcome home drive around the island and discovered bulldozers, barges, and large pipes on the Presque Isle beach. She learned to her dismay that the Presque Isle Power Plant planned to further develop the Island, changes that she felt would drastically alter the park. Encouraged by the support she received from some of her fellow citizens, Julia and her friends composed an “Open Letter to Marquette and Cleveland Cliffs” protesting the further development of Presque Isle. She personally delivered the letter to the top executives and board of directors of Cleveland Cliffs Iron Company. Soon Julia found herself writing more letters, including a series of letters and alerts that she published in Marquette’s Action Shopper, because she said that local newspapers and other media outlets either refused to cover their fight or covered it insufficiently. In one of the alerts, Julia pointed out the dangers of mill scale, solid iron particles that cling like fish scales to the sides of a steel mill after the melted iron has been emptied out. Because of its polluting properties, environmentalists fought to contain it around large steel mills instead of dumping it in the country, creating huge piles of mill scale around Detroit, Chicago, Gary, Cleveland and anywhere else steel was manufactured. Julia wrote that Cleveland Cliffs had secretly brought mill scale into Marquette for the past three years and intended to bring in boatloads of it as soon as the company had completed what it falsely called a new coal unloading dock. She also charged that Cleveland Cliff was converting mill scale into solid iron ore pellets, a process that released iron oxides and particulate into the air. In one of her concluding arguments she said that Cleveland Cliffs Iron lied by insisting that the unloading facility was for coal when it was really for mill scale and that state and local politicians backed them for economic reasons. 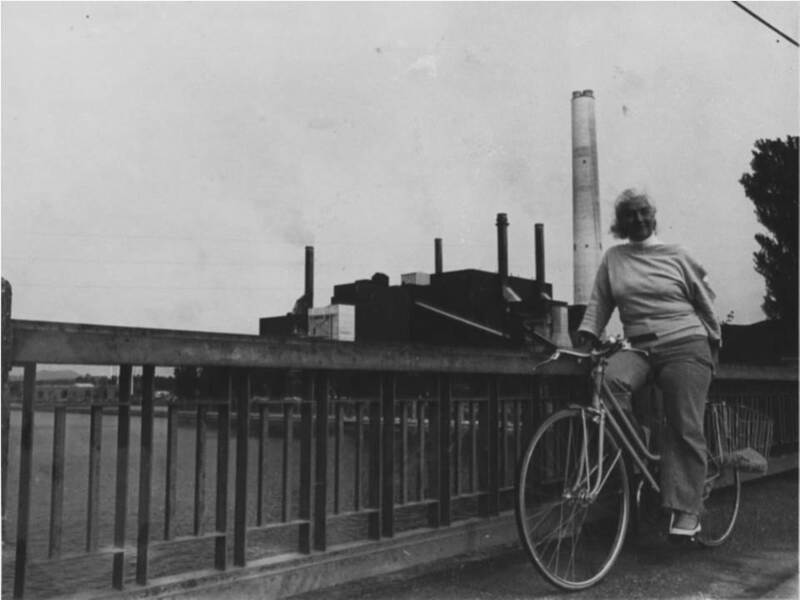 As her crusade to preserve Presque Isle progressed, Julia Tibbitts experienced the perils of taking a stand and acting decisively on controversial issues while living in a small town. People she believed were her friends for years no longer were her friends. Other friends had to restrict their friendship and remain silent or anonymous for fear of economic repercussions from Cleveland Cliffs and other businesses and government bodies. According to Julia, Superior Public Rights Incorporated members-numbering about 45- were never publicly identified to prevent economic retaliation from Cleveland Cliffs Iron Company, its affiliates, and friends. Julia also experienced a smorgasbord of lawyers, the four Superior Public Rights Incorporated lawyers and opposition lawyers from Cleveland Cliffs and its allies. She hired lawyers and she and a few fellow Marquette citizens created a corporation that they called Superior Public Rights with a mission to enhance, protect, preserve the shoreline of the city of Marquette and the surrounding region and to defend the public trust. Superior Public Rights interpreted the public trust as the land, shoreline of every ocean, lake, river, or stream being owned by the United States Government with each state as trustee. Superior Public Rights brought a class action suit and incorporated to sue the Michigan Department of Natural Resources, the Upper Peninsula Power Generating Company, and the Lake Superior and Ishpeming Railroad for giving corporations permits which it deemed invalid because they were illegally given and illegally received. Superior Public Rights stated that it would prove in court that devices like intake pipes, coal unloaders, discharge pipes, hot water discharges and the inevitable runoffs cause significant environmental damage to communities. Cleveland Cliffs and its subsidiaries owned percentages of the capital stock of each company. Superior Public Rights sued for 100 million dollars, charging that the corporations had taken/given public Trust shorelines illegally. Many Marquette citizens, both civic and corporate, cast their vote for Cleveland Cliffs Iron Corporation which launched its own campaign in letters and hearings, contending that it was doing no harm to the Presque Isle environment. Superior Public Rights remained steadfast in its stance against the power company expansion even when the city of Marquette threatened to sue the organization. The city later dropped the suit, but the gully between the opposing factions of its citizens became a Grand Canyon. •Clarified the fact that the “burden of proof” is on the party who wants to use bottom lands or the public trust to prove that they will not harm them or that there are valid reasons for changing them. •Contended that the judge must make independent findings in environmental cases from the material presented and the judge must read the material himself. •Proved that citizens in class action suits like the one that Superior Public Rights Incorporated brought against Cleveland Cliffs to preserve the environment are entitled to have their attorney’s fees paid. This set the precedent for environmental lawsuits because most ordinary citizens cannot afford huge legal fees that corporations pay in such suits. •Established the precedent that the Department of Natural Resources and the Natural Resources Commission when leasing the bottom lands and the Public Trust for a company’s exclusive use must give back something to the public for that use. “We carried this kind of thinking all through the night of attack, innuendo, ridicule, secretiveness, lying, cheating, stealing, scorn, and environmental ignorance like a powerful little torch, until we lit up the whole sea of proceedings with these four principles as the decision of the Judge of the Circuit Court of Ingham County dropped the whole mess down on our heads. Eight points brought forward. Eight counts lost. His requirement to make a public park at the unloader site became our one small victory. There it sits. In 1991, Julia updated the story of her unsuccessful battle with Cleveland Cliffs Iron Corporation and her hometown of Marquette. She said that smelt no longer ran at the Dead River mouth as they had for decades because they could no longer navigate up the river to spawn because of the power plant operations and that the power company had been known to reverse the flow of the Dead River to obtain cooling water. She questioned the legality of the reversal. ​According to Julia, in 1991 Cleveland Cliffs sold nearly 300,000 acres of land in the Upper Peninsula to the Japanese and shortly afterward sold the Presque Isle power plant to Wisconsin, agonizing that the power plant continued to pollute. Julia felt that everyone would reach the ultimate to be wished for – progress, and she was willing to risk her own money, community standing, and time to put her beliefs into action. Bryant, Bunyan. Michigan: A State of Environmental Justice? Morgan James Publishing, 2011Dempsey, Dave. Ruin and Recovery: Michigan's Rise as a Conservation Leader , University of Michigan Regional, 2001. Spring, Barbara. The Dynamic Great Lakes. Independence Books, 2002. Tibbitts, Julia K. Let’s Go Around the Island. Lake Superior Press, 1992.